At the Schumacher Family of Dealerships, we don’t just sell cars. We invest in long-lasting relationships. Why? Because we grow when you grow. We’re hiring for a number of positions and applying online is easy. Learn more about what you can expect when you join the Schumacher Family. Are you ready to join the Schumacher Family of Dealerships? 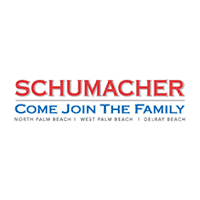 You can also contact Sharon Madden at (561) 656-5549 or send your resume to Jobs@Schumacherauto.com. We are people serving people. Our customers and employees are our greatest assets and we respect and value their contributions. We are committed to sincere relationships with our customers and employees that are built on consistency, honesty, respect, and fairness at all levels. We are focused on exceeding the expectations of our customer and employees that are built on consistency, honesty, respect, and fairness at all levels. We are committed to honoring the Schumacher Social Contract. Our priority is developing relationships that results in teams that are focused on personal growth and positive results for our customers and coworkers. We are committed to setting the standard in our industry in sales and market share that result in rewards that insure the long-term commitment and personal growth of our employees and our company. This Success and Stability will result in a team of employees and customer base committed to us for life. The vision of the Schumacher Family of Dealerships is to be an organization composed of genuine, caring people with shared values and a shared commitment to a culture of honesty and respect that far exceeds the expectations of our customer and each other. The Vision of our Team is to be an organization that people aspire to be a part of. We will ensure a skilled and dedicated workforce committed to the personal and professional wellbeing of all the members of our organization where every member of the team is empowered to perform his or her job to the highest standard possible and play a vital role in fulfilling the Mission of the Organization. We are professionals who know the business, we are locals who know the market, we are volunteers who serve the community, and we are a family of dealerships who want to serve customers for life. We care and caring starts with respect. We recognize and respect that buying or leasing a new vehicle is a big family decision. We strive to make the experience transparent, convenient, affordable, and enjoyable from our family to yours. When you join our family you can be assured that over 50 years in the business has taught us that while high-quality products and a carefully crafted car buying experience may bring you on the lot; delightful team members and unparalleled customer service are what keep you here. Our customers become family, and you will be treated as such. With over a million completely satisfied customers, we are grounded in faith and rooted in service to the community. Through the Schumacher Family Fund, we offer a fresh start on life, positive energy, good health, and a bright future. We grow when you grow. We agree to hold ourselves and each other accountable and give 100% effort to our mission. In the event of conflict we agree to address issues quickly, privately and face to face. We will communicate by listening openly and giving feedback as we seek resolution. In the event of unresolved conflict we agree to seek a third-party peer mediator. We pledge our support for this social contract and commit our personal efforts to uphold it in our daily interactions.